Get quick facts on the BMW i3 at Autocade. It was too good a chance to pass up: a week with BMW’s i3 electric car. While Lucire had sampled the i3 a few years ago on British roads, we hadn’t given it a full evaluation as we had done for other models, and as it’s BMW’s centenary, it seemed right to kick off our celebrations for the German brand with a vehicle that could represent the dawn of its second century. The i3 was a clean-sheet design, unencumbered by ideas of previous BMWs. Its platform is unique, as is its power source. While BMW had dabbled in electric cars before that were based on its regular saloons, the i3 was completely rethought, with the company analysing what drivers, and society, would demand from mobility in the future. As we’ll detail later, there’s very little that we could spot that’s carried over from the BMWs we’ve sampled in the past. You get the sense that the Bavarians relished the opportunity to rethink just what defines a car, or, for that matter, what is a BMW. There’s also a real sense that the i3 is a test-bed for future ideas, a vehicle that has one foot in the world of concept cars, and the other in our one, where we can hop into a dealership and acquire one now. It isn’t built like other cars: the Lifedrive architecture essentially means the car has a lower Drive Module comprising the batteries, range extender (which we’ll come to) and wheels, and a Life Module, a strong structure above which comprises the cabin. There are no outrageous claims here: BMW would like the i3 to convince you that it’s the future of motoring from its own merits. 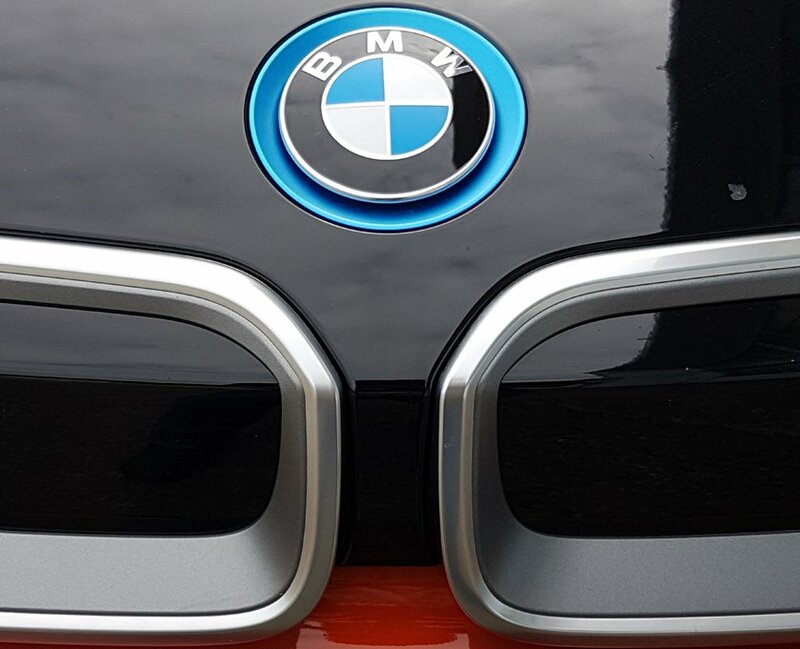 You sense this from meeting it: yes, there’s a kidney grille, or at least something that resembles the traditional BMW kidney grille but it’s really a chrome outline stuck on to the bonnet. There isn’t a radiator per se, because the i3 doesn’t need one. 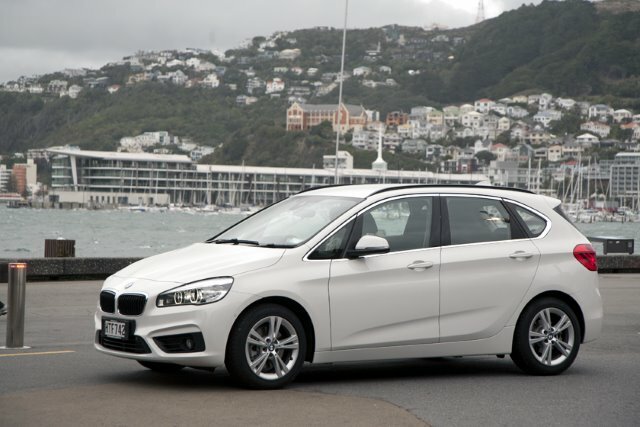 The Hofmeister-Knick, the BMW window line that is meant to identify the brand’s cars, is also missing, replaced instead by a six-light design where the central window steps down, before rising up again for the last one. The whole body conveys the impression that it is sleeker down the back, thanks to the clever application of the car’s body colour, even though the rear cabin remains quite roomy. 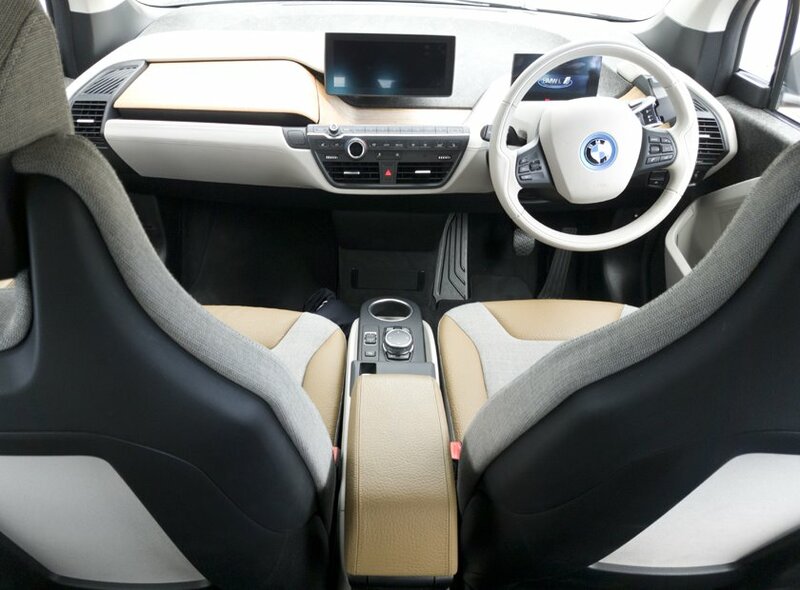 The rear doors open in “suicide” fashion, but you need to open the front ones first: they are designed to allow easy entry and exit from the rear seats but don’t detract from the lines of the i3. Finally, the D-pillar is blacked out, giving the i3 the currently in-vogue “floating roof” look. A blacked-out bonnet, roof and rear tailgate provide a smart, two-tone look to the car, and while the black bonnet might recall cooking versions of the Ford Capri Mk I (which had blacked bonnets so that racing drivers would not get dazzled by reflected sunlight), you actually can’t see the bonnet while you are driving. It’s strictly done for fashion reasons. 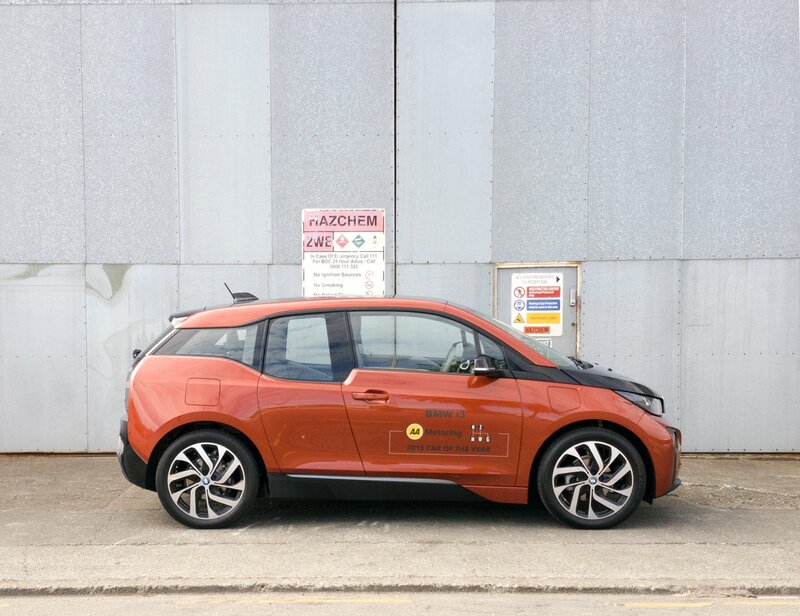 The body itself has a lot of carbonfibre-reinforced plastic and sets new standards in the use of renewable materials: the company is keen to do its part to make the i3 sustainable. Inside, the BMW i3 is a masterpiece. 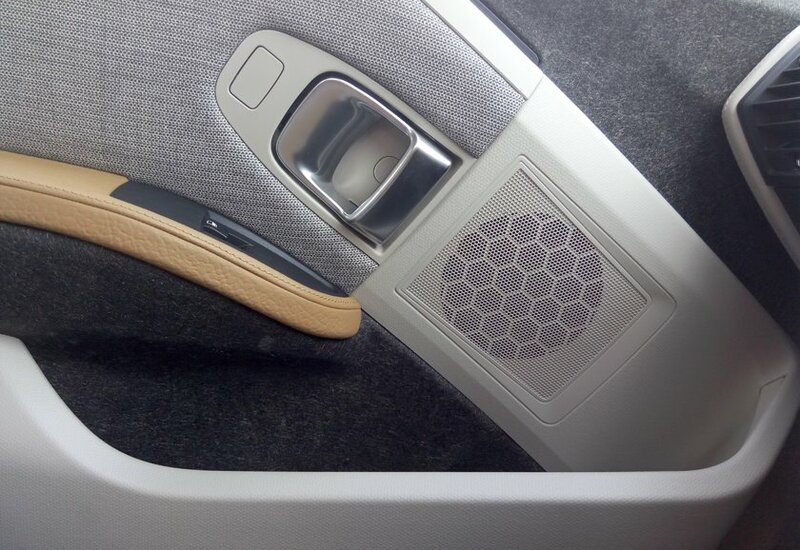 Recycled eucalyptus wood has been sculpted along the dashboard, and is particularly pleasant to the touch, while honeycomb patterns subtly abound in the speakers in the doors. Over 25 per cent of the interior uses raw and recycled materials. A central screen appears as though someone had stuck a tablet there, while the driver has their own display, showing primarily the car’s remaining charge and speed. The colour coordination within is like a comfortable, futuristic lounge, and that’s hardly an exaggeration when you discover how comfortable the seats are. 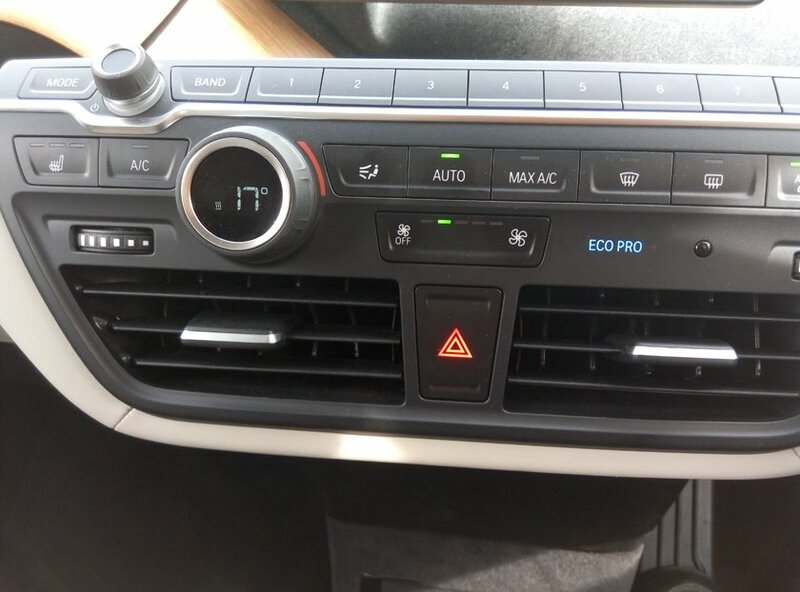 The BMW badge on the steering wheel boss looks like it’s surrounded a blue light (it’s just very nicely reflective plastic), while the controls are very familiar to anyone who has driven the company’s regular petrol and diesel models. The i3 mixes just enough from the regular BMW world with its gee-whiz lounge of the future, again straddling those notions of concept car and production reality. Door pockets are slightly on the small side, while the location of the inside handles to pull the doors shut isn’t immediately obvious, again reminding you that this could almost be a concept car, or at least a car that has been fully rethought. 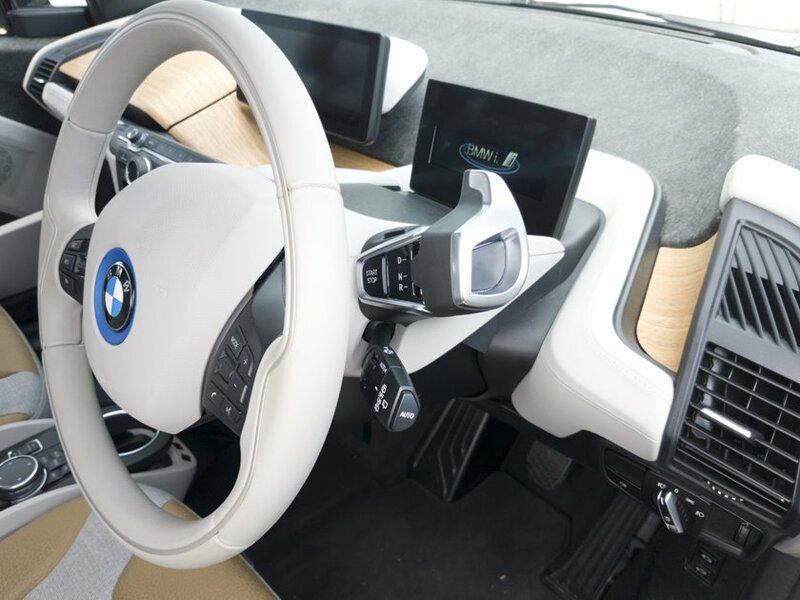 As one of BMW’s people put it, the i3 has the footprint of an Einser, the interior room of a 3-series, and the interior finish of a 5, and that’s not a bad way to look at it. Certainly our test car had no niggles whatsoever inside, and we could even go so far as to say it’s one of the best BMW cabins we’ve been in. Add to that the airiness of the glasshouse, you begin wondering just why fashion, of late, has dictated that cars have such high waistlines and tiny windows. Surely airy is the way to go. It’s when you start the car, by way of a button, that things start getting unfamiliar. 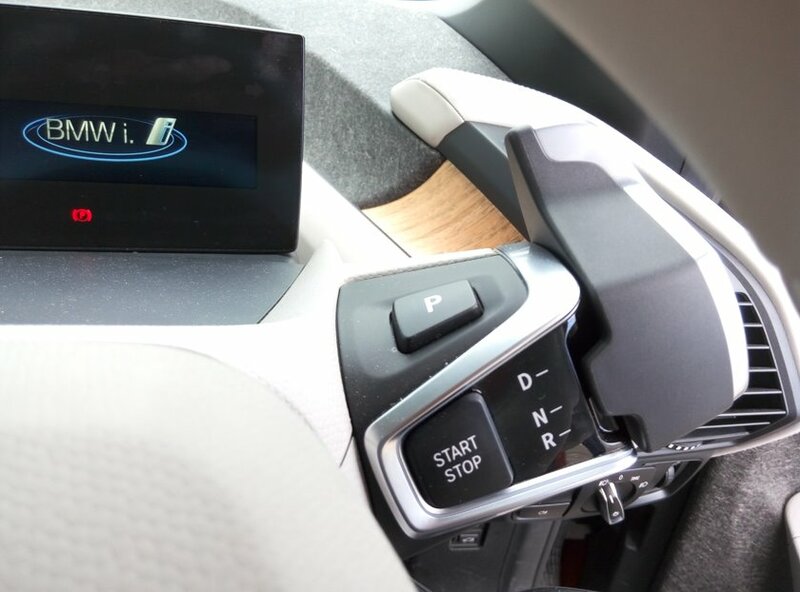 There’s no internal combustion engine that springs to life: start, select the gear using the paddle to the right—this is the one item that’s not from your regular BMWs—and release the handbrake, and you’re off in total silence. Starting the car, you also see the display in front of you detail how many kilometres you can expect to get. The typeface isn’t the usual Dalton Maag-crafted BMW Type, but something more humanist, in keeping with the car’s different vibe. 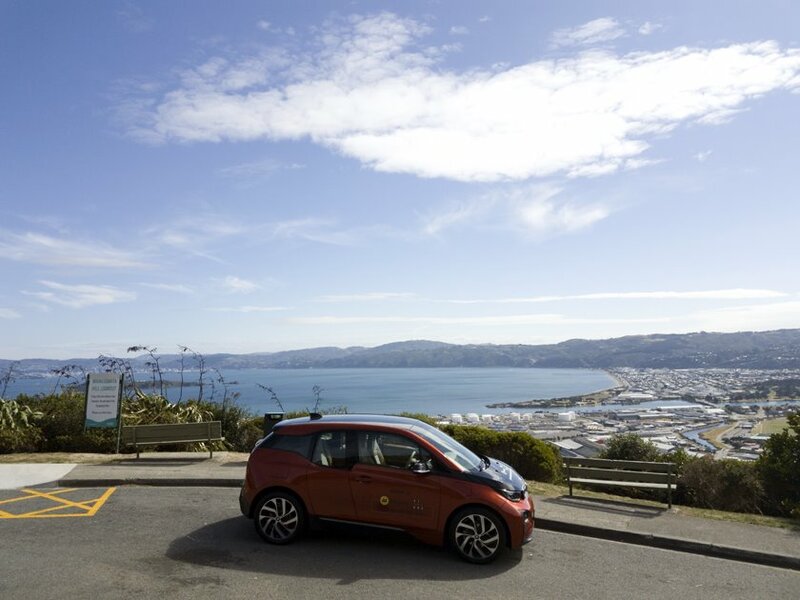 When charged, the i3 has roughly 150 km that you can use, and that’s more than ample for a week of our regular commuting. Should you find yourself stuck, then this particular model has a range-extender, a tiny two-cylinder motorcycle engine hooked up to the rear axle (yes, it’s rear-wheel drive) that can get you out of trouble and give you 100 km on the small petrol tank that the car has. It should be noted that the i3 is not a hybrid: the range extender will not kick in till you exhaust the electricity. If only the 1980s TV character Automan had such a feature. The automatic gearbox is a CVT one, so you never feel any changes, but that’s something drivers will have experienced before. What is rarer, however, is the instant torque that the i3 delivers. You don’t need to change through the gears to find the best torque range for the car: it’s there at any speed, because of the electric motor. This tall city car was more than a match for motorcyclists and even an Audi S4 at the lights as it vaulted to the legal maximum in under eight seconds, although it isn’t something that BMW recommends you do. If you’re intent on helping the environment, then heavy acceleration drains the battery, which means that you’ll have to recharge it, and the juice still has to come from somewhere. It’s simply a counterintuitive thing to do. Stopping is also something that one has to get used to. The brakes work just like any other car, but there is so much resistance the moment you take your foot off the accelerator that at low speeds, you mightn’t need to use the brakes at all. It’s what we imagine driving a forklift to be like, except for the fact we are doing so in total, colour-coordinated comfort, and the resistance you feel recharges the battery as BMW recaptures the energy, as with any braking energy, with its Efficient Dynamics system, something the company has perfected over the years. 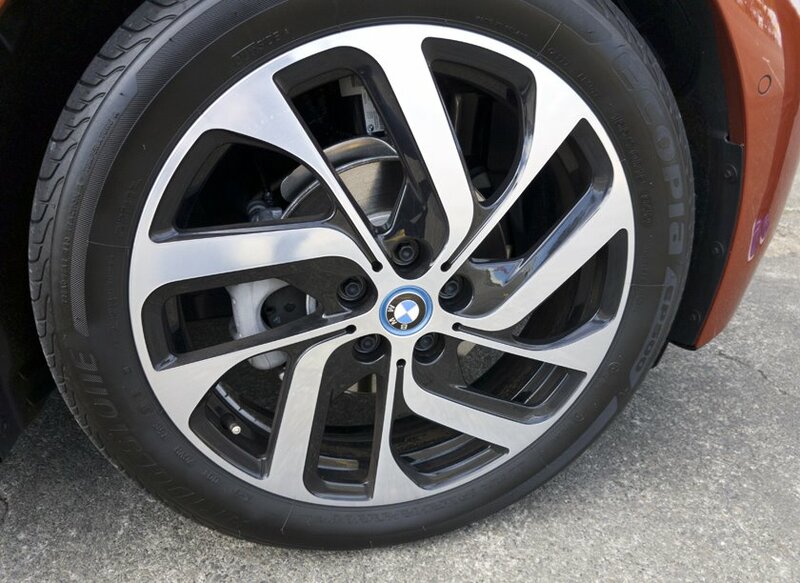 You might think the instant torque would make the i3 ‘the ultimate driving machine’, and in a straight line there certainly is ‘Freude im Fahren’, but as you sit higher, over the Drive Module, you sense that there is a higher centre of gravity. Whereas in earlier BMWs you could set the cruise control to a certain speed and steer around the corners to see how good the grip was, the i3 is programmed to slow down for those corners—definitely a good safety move from the stability control system, but you get the feeling that BMW doesn’t want you to explore the i3 at speed. 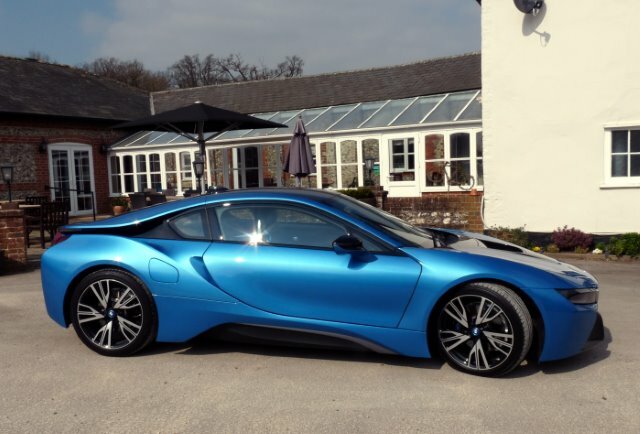 It’s easily argued that this isn’t want the car is made for, and like all electric cars at present, they are bought by people who want economical urban motoring, not for hoons. Around town, then, it is a perfectly civilized machine, but its ride is on the firm side, and despite the weight bias at the rear (57 per cent), there is a hint of understeer, which the stability control neutralizes. The steering feel, however, is very BMW, with a decent weight and responsiveness that would be quite satisfactory in one of its sport models. The modern lounge interior effect is never spoiled by anything like wind noise, making the cabin a splendid place to be regardless of whether your commute is urban or motorway. 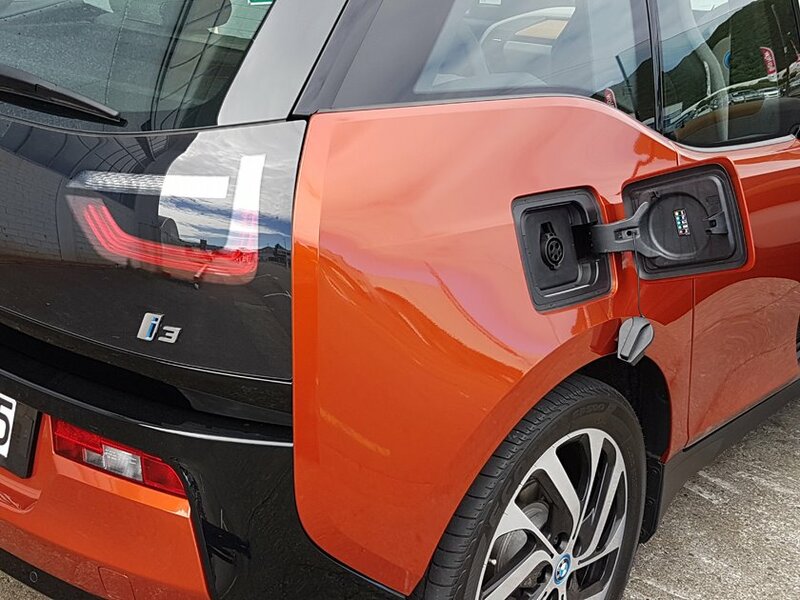 Above: Two sources of power for the BMW i3 with range extender: electricity down the back, and a fuel filling flap for petrol up front. Charging is the big novelty when you get your i3 home at night. 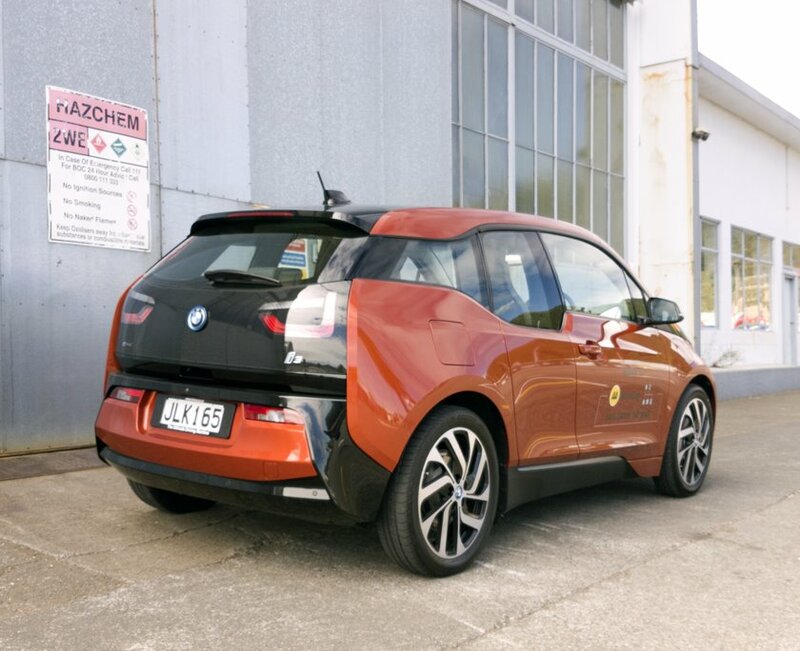 Fast charging stations such as those from Charge Net NZ, or BMW’s fast-charging kit (which our test car wasn’t supplied with), will get the “tank” to full in 20 minutes, but plugging the car in to the mains meant a much longer process. Our first charge, of half the battery capacity after a day’s hard driving, took the best part of eight hours on a conventional 240 V line, but this should suffice for most nine-to-five users. 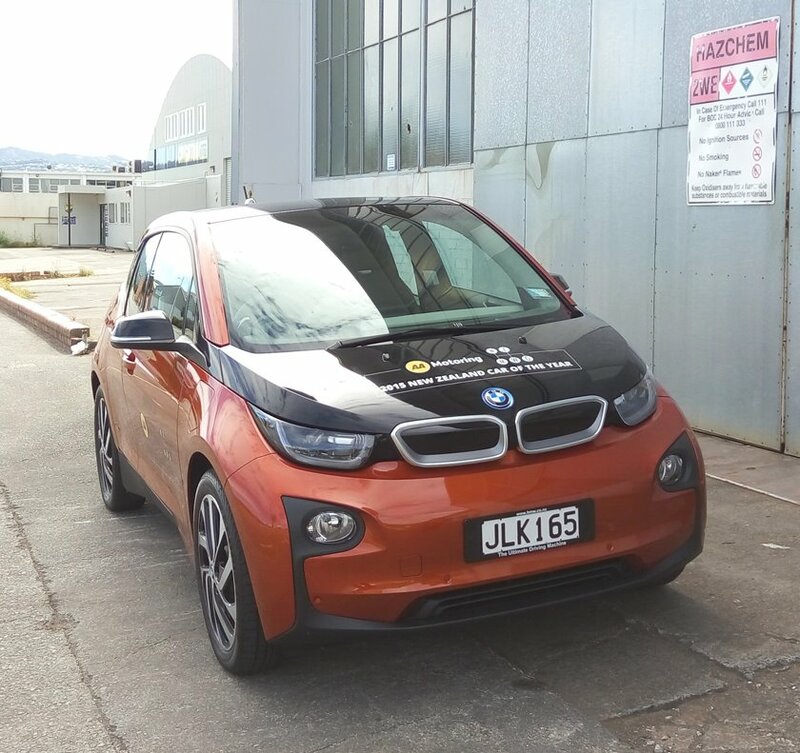 Toward the end of the test, when we were using the i3 as a real-world buyer would, we didn’t even bother charging it up, because those tiny commutes barely touched the capacity. We could foresee an urban buyer needing to charge up on a weekly basis, rather than a daily one as they would do for a cellphone. Nevertheless, charging became an easy process, the adjustment only as great as one you would adopt when you buy a new phone. 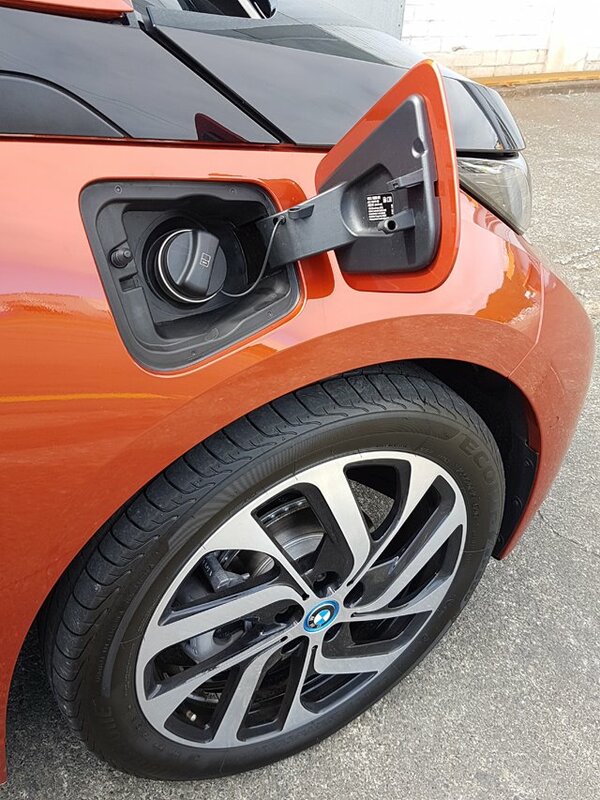 Everything is simple to use: plug it into the mains, the charging device tells you if electricity is flowing or if there’s a fault, and the other end goes into the socket behind where you would expect the fuel filler flap to be. It initially flashes a soft blue, the same as the one round the steering wheel logo, to give you the reassurance that you’re doing something for the planet, although the flashing eventually switches off so as not to attract enquiries from less scrupulous types. Once charged when you get to the car in the morning, it’s green. 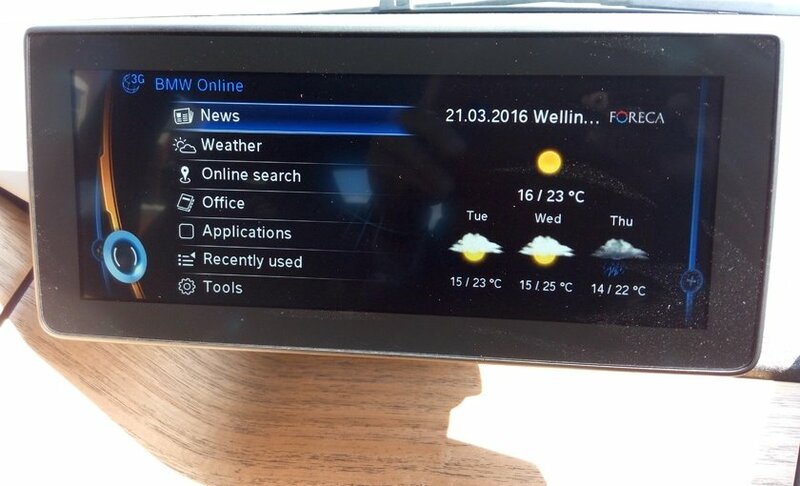 A read-out in the corner of the driver’s display LCD tells you what time you should expect the car to be fully charged. In our test, we never had to use the range extender, whose fuel goes in through the car’s front filler flap. And with EECA and Better Trust NZ recently proving you can make it from Cape Reinga to Bluff in electric cars, and Charge Net NZ reaching its goal of 100 charging stations nationwide, there must be less range anxiety out there that makes the electric car a no-brainer in New Zealand, where our power comes to some degree through hydroelectric sources (57 per cent, though down from 80 per cent during the Muldoon years). 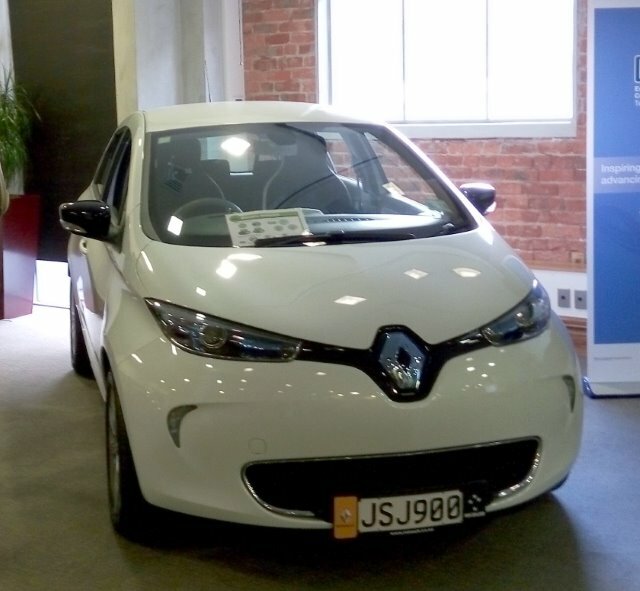 Outputting carbon emissions of 13 g/km, it’s the greenest car we have ever had on test.